Place petit tender on foil-lined baking sheet. Stir together paprika, oregano, smoked paprika, garlic powder, salt, pepper and mustard; rub all over petit tender. Let stand for 20 to 30 minutes. Barbecue Sauce: Meanwhile, in saucepan, bring to boil ketchup, vinegar, 2 tbsp (30 mL) water, brown sugar, molasses, Worcestershire sauce, garlic, paprika, salt, pepper and hot pepper flakes over medium heat. Reduce heat; simmer for 10 minutes. Set aside. Grilled Caesar Salad and Cherry Tomato Skewers: Preheat grill to medium heat; grease grate well. Thread cherry tomatoes onto soaked bamboo or metal skewers; grill, turning, for 10 minutes or until browned and blistered. Remove from skewers. Meanwhile, grill romaine lettuce, turning, for about 4 minutes or just until lightly charred. Remove and tear into bite-size pieces. Set aside. In food processor, process vinegar, garlic, anchovy paste, mustard, salt and pepper. With machine running, slowly add olive oil through feed tube until dressing is emulsified; add Parmesan cheese. Increase heat to medium-high; lightly grease grate. Sear beef for 3 minutes on each side. 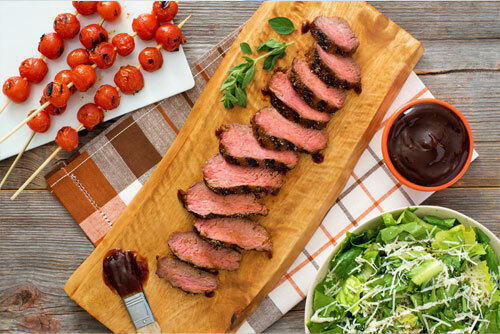 Reduce heat to medium; cook, turning, for 15 to 20 minutes or until internal temperature reaches 145°F (63°C) for medium doneness, basting with about 2 tbsp (30 mL) Barbecue Sauce in the last 5 minutes of cooking. Toss grilled romaine lettuce with dressing and top with tomatoes. Serve petit tender with remaining Barbecue Sauce and Grilled Caesar Salad and Cherry Tomatoes.